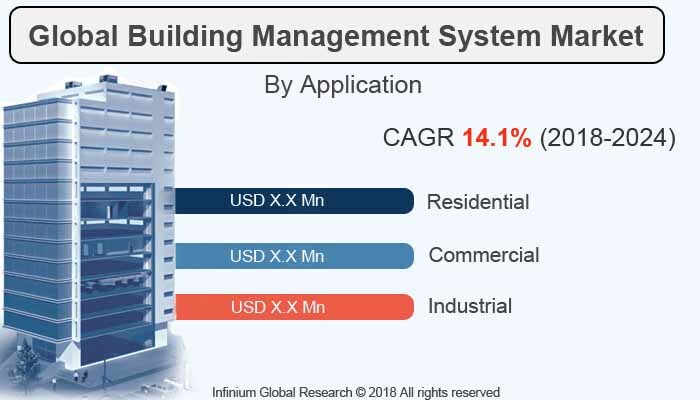 A recent report published by Infinium Global Research on building management system market provides in-depth analysis of segments and sub-segments in global as well as regional building management system market. The study also highlights the impact of drivers, restraints and macro indicators on the global and regional building management system market over the short term as well as long term. The report is a comprehensive presentation of trends, forecast and dollar values of global building management system market. According to the report the global building management system market is projected to grow at a CAGR of 14.1% over the forecast period of 2018-2024. Building management systems (BMS) refers to building automation system that ensures increased safety, comfort and efficient resource consumption. The BMS is a computer-based system installed to effectively monitor and control the mechanical, electrical and electromechanical services including security, lighting, ventilation, fire, power systems (electrical, steam, gas, and oil) and water system. The building management system is significantly used in the industrial, commercial and residential building owing to its energy efficiency, cost-effective, high Comfort and several other benefits. The factor driving the growth of the BMS market is the energy and cost effective solutions offered by building management system market, especially in the commercial industries. In addition, the demand for energy efficient and eco-friendly building is rising to very rapidly across the world that is likely to escalate the growth of Building management system market. However, the installation cost of building management system is high that may restrain the growth of building management system market. Moreover, the trending integration of internet of things (IoT) with the various system and the Integration of Analytics in building management are projected to create the several opportunities in the building management system market in upcoming years. In addition, the growing demand for building management system across various emerging regions is expected to contributing to the growth of the BMS market over the forecast period. Geographically, Europe holds the maximum share in the building management system market and is expected to remain the largest region over the period of 2018 to 2024. The various government agencies are taking initiative in the adoption of building management system as they offer energy and cost-effective solution. Moreover, raising awareness about energy efficient and eco-friendly services drives the growth of building management system market in this region. Furthermore, the Asia Pacific is the fastest growing region in the building management system market. The rapidly growing demand for building management system from the growing countries like China and India are likely to boost the market growth in the Asia Pacific region. The report on global building management system market covers segments such as component and application. On the basis of component the global building management system market is categorized into hardware, software and service type. On the basis of application the global building management system market is categorized into residential, commercial and industrial. The report provides profiles of the companies in the global building management system market such as Honeywell International Inc., Johnson Controls International PLC, Schneider Electric SE, Siemens AG, IBM Corporation, United Technologies Corp., Delta Controls and Ingersoll-Rand Plc. The report provides deep insights on demand forecasts, market trends, and micro and macro indicators. In addition, this report provides insights into the factors that are driving and restraining the global building management system market. Moreover, IGR-Growth Matrix analysis given in the report brings insight into the investment areas that existing or new market players can consider. The report provides insights into the market using analytical tools such as Porter's five forces analysis and DRO analysis of building management system market. Moreover, the study highlights current market trends and provides forecast from 2018-2024. We also have highlighted future trends in the building management system market that will impact the demand during the forecast period. Moreover, the competitive analysis given in each regional market brings insight into the market share of the leading players. This report will help manufacturers, suppliers, and distributors of the building management system market to understand the present and future trends in this market and formulate their strategies accordingly.